Anyone knows a kid who doesn't like music? I bet you can't find one. Play a music and any kids will dance in front of you with delight on their faces or may even hum a tune or sing a song. Kids enjoy music a lot because music is universal, it's everywhere. These days, a lot of kids shows play songs that make children sing and dance along with their fave cartoon character. A party is not complete without music too. Imagine a party without music and for sure it is soooo boring. There are even pregnant women who play a lot of classical music like that of Mozart while their baby is still in their womb and this is also one of the reason why some kids developed a keen interest to music.. My own sister did this and true enough her daughter was interested in music and is not taking a course in music in Sydney. Most of the kids these days are exposed to music early on their life. Some parents even enrolled their kids to music schools during summer or school break once they see their child has an interest on music. Get a cheap hammond keyboard if you can afford and let your kids practice to hone their skills. It's always fun to see kids enjoy what they love and as parents you have to encourage and support them as much as you can. Music can also enhance creativity and learning, watch how kids or even adults work on something when there is a soothing music on the background. I have to say that I love hearing instrumental music when I need to focus on something or even when I need to write a long article. The cold weather these days made a lot of people sick. Temps varying from 20’s- to the lowest of 15.+C in Metro Manila and C at Baquio and higher areas made a lot of Filipinos pull their jackets out of their closets. For a tropical country like ours with normal temperature of 30C almost every day, a sudden drop of temperature will be too cold already. The weather bureau said that this cold season will last till mid of March. Though the very cold weather is a welcoming change for all of us, there is no doubt that many are still complaining because a lot of people are getting sick already. I never thought that I will be affected by the cold virus but when my niece got sick for a week due to colds and cough, I had already an insight that I might catch the virus. 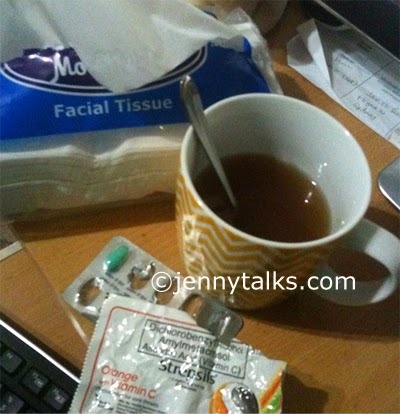 Indeed, after she got well, I started to sneeze and later on I got sick already. I took some strepsils to ease the itchy throat that I am having while I also drowned myself drinking lots of warm Salabat (powdered ginger) with honey, calamansi juice and lots of water for I know I need to flush all the viruses inside my system. I also see to it that I cook warm soup dishes that can ease my clogged nose as well. I got cold feet and even had fever for almost 2 nights and I had to do the sponge bath on myself to lower down the high temp in my body and also to make me feel fresh. A cold medicine (Neozep) also helped in my recovery and I remember the 2 nights that I have clogged nose that made me breathe through my mouth. Open-mouth while sleeping is so hard for it dries out my mouth and of course the air is not filtered unlike when it passes through my nose. Ahhh.. it was just so hard. Right now, I recovered already and I was only sick (but not totally down) for almost 3 days because I made sure that I drink lots of fluid and eat right kinds of food. Ahhhh..... nasty virus, I hate you!! If you have coughs and cold already, remember to drink lots of fluids, eat healthy foods and rest so you can recuperate fast just what happened to me. During my younger years, singers/band like Depeche Mode, Tear for Fears, Spandau Ballet, Madonna, A-Ha, Rick Ashley, Menudo and Duran-Duran just to name a few ruled the 80’s music scene. The music trend that time was New Wave with dances that mostly uses hand while dancing. It was such a fun era where music are heart-warming, relevant, have good message. 80’s music still ruled and up to these days, there are still songs that are being played on the radio and singers who are reviving the songs giving their own rendition and touch to it. Though every one has its own taste in music, I have never been inclined to pure rock or metal songs and even rap. I simply could not tolerate the sound and the noise in them though there are some mellow rock songs that are still pleasing to the ears and made it through all the charts. These days, my niece is into KPOP music that is popularized by Korean singers. I’m not so sure why they are into it but I guess those Koreans have a certain charisma because the way they sing and project on stage can make all the girls go ga-ga on them. Not to mention their fashion sense. Some young ones are trying to have a Korean haircut/style and Korean way of dressing. The way they sing coupled with focusrite scarlett 18i6 equipments and effects, good looks and fashion style can always melts every girl's heart. Oh well, I also remember going ga-ga over those Puerto Rican members of MENUDO where Ricky Martin, Robby Darosa etc. are part of it. I wonder what songs or music trend will the next generation of teens will have after 5 or 10 years. All I know is that every generation has its own charm and trend that only those that are “born” within can only know the meaning. Wow, another season for American Idol this year and I'm quite excited. I remember the nerve wracking performances of Jessica Sanchez and Philip Phillips at the finals and I was rooting for Jessica to win, not that she has a Filipino blood but she has a great talent. Eventhough a lot were disappointed with the result because of Philips' winning, I have to say that he has his own following and great talent too. Been watching the auditions of AI13 on TV and again there are heaps of great talents that JLO, Keith Urban and Harry have unearthed and I hope they will shine once they go to Hollywood for more steep competition. Georgia has some promising singers and some I would say want to follow the footsteps of Philip Phillips with their country voice and guitar but I know they need to be unique and be themselves. There are heaps of martin acoustic guitars at musicians friend just in case some aspiring guitar players want to acquire their own guitar. It's also funny to watch bloopers and those that have been rejected because of their outrageous or out oft his world performances. I know they just wanted to have fun on the show and not really want to be in AI because they really have no voice in the first place.